Located inside the new Castaway event space in Burbank, the Green Room is a new speakeasy-like cocktail lounge that opens today. The space is open on Fridays and Saturdays, and guests choose one of three ticketed reservation experiences: the seven-seat bar, the 80-seat lounge, or the 25-seat patio. 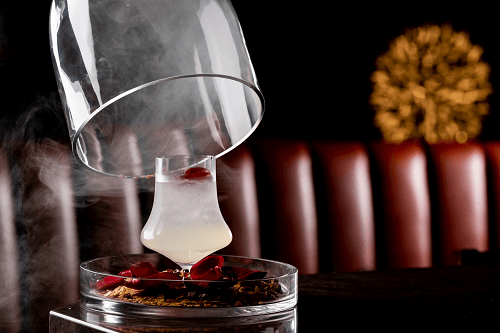 Cocktails served in hand-blown glassware are inspired by the film industry, such as a Beauty & the Beast-inspired drink served in a bell jar and garnished with rose petals. The stylish venue, designed by Hatch Design Group, has an elegant jade and gold color palette and hilltop views of Los Angeles.